TeleTracker Online automatically populates the Products Returned Tab with each of the products sold on the original Invoice. (4) Select which product you wish to return. You may enter the quantity returned either by clicking on the Qty (Quantity) field and typing the number, or by using the arrows located on the right side of the Qty field. 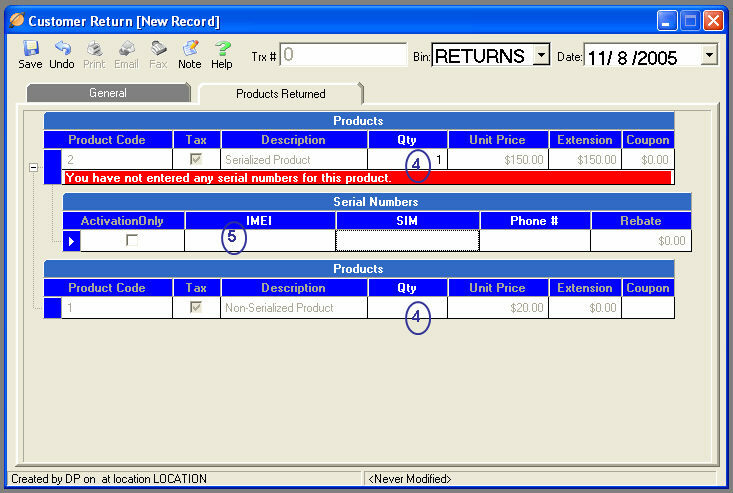 To determine the number of products available for return, hover the mouse over the Qty field. A yellow box will appear reflecting the respective product’s quantity available for return. TeleTracker Online automatically calculates the quantity available for return by subtracting any previous returns from the original quantity sold. TeleTracker Online will automatically populate the Coupon field with the original value of any coupon used during the original sale and this field cannot be edited. (5) When returning Serialized Products, a sub-screen will appear prompting you to select the corresponding serial number of the product being returned Generally, this will be the ESN or IMEI number. To select a valid serial number, click on the field and highlight the serial number of the product being returned. You may also click into the serial # field and scan the serial # with a barcode scanner, or manually type the serial # into the serial # field. Before the Return is saved, TeleTracker Online will verify that the serial # entered is correct.